With health and wellness becoming an increasingly important aspect of life due to various diseases and complications it is very important for individuals to receive the correct information of dieting techniques and exercise. For women, in particular, it is crucial that they diet in a safe way in order to avoid disrupting hormone levels and menstruation patterns. Many women admit to have so called “yo-yo dieted” in the past, referring to a rollercoaster of dieting and gaining weight. These fad diets present themselves and while they may work initially, it is typically temporarily. Since a majority of individuals are not nutritionists, exercise physiologists, doctors, and so on, they do not understand the downsides to these diets until it is too late and they are putting the 20 pounds lost right back on. Many of these diets work by manipulating a macronutrient (carbs, proteins, fats), and expressing that the results will come quickly. By manipulating these three nutrients it is very possible that an individual will lose weight, but they have to be manipulated just right for it to be a healthy approach. If any of the three are too low or too high, it may not be sustainable or ultimately effective. Many people have heard of no-carb or no-fat diets. By following these particular diets it may be denying the body of certain elements it needs, especially if the individual is accustomed to working out regularly and intensely. Instead of restricting nutrients in this way, it is much more effective and sustainable to find a ratio of each that works for the body. Some people may respond better to different ratios of macronutrients and even lowering one can demonstrate significant changes in weight or body composition, without complete restriction. This also enables the person to have flexibility and they will be more likely to stick to their regimen. If it is just a few pounds to lose, or upwards of 100, it is very important to lose the weight in a safe way that does not disrupt the processes of the body and the mind. Along with physical limitations associated with weight loss, many mental limitations are also linked. A lot of women experience depression, mood swings, and binge-eating episodes while dieting. This all stems from the mental pressure placed on an individual while they are trying to lose weight. Many can attest that losing weight is mostly a mind game if you have all the resources available to you. It’s important to maintain willpower while also being understanding and allowing yourself to recover and come back stronger after a failed attempt or “bad day” of eating. At a young age of 16 I had the opportunity to pursue a weightlifting class through my high school. From that point forward I fell in love with lifting weights and proving that women may be stronger than they appear. I have seen many women in the fitness industry who have fallen in love with weightlifting, powerlifting, and Olympic lifting. This has presented an amazing image for young women who may think that these sports are male-dominant sports. These strong and motivated young women who openly share their weightlifting journeys are doing amazing things by inspiring their fans and followers. One athlete in particular that is striving to not only accomplish her goals but drive others is Mattie Rogers, a Team US 69kg weightlifter. Through her use of social media she has displayed her success, failures, and motivations. She is an idol to young lifters, especially females. She's continuously breaking records while still remaining humble about her achievements. I feel that athletes such as Mattie, who display female lifters in such a positive light, are the leaders who are influencing more and more young women to get involved in a sport that they may not have formerly considered. She lets followers and fans know that the sport is not something that should be feared solely because not many females participate. Besides Mattie, plenty of other female influencers on social media have given respect towards females trying to compete in weightlifting sports. A very popular powerlifter and youtuber, known as Megsquats, is also doing amazing things with her YouTube platform to spread her experiences with powerlifting. She has proven herself time and time again and really opened the door for female lifters in this sport. She is extremely strong in every sense of the word and the way she inspires others through her channel really shows that. While Mattie and Meg are just two females who have really stood out to me as influential lifters, there are many others who are actively trying to get the word out. Females are just as capable of lifting heavy things as men are. I believe that this is just the start of females getting involved in these sports. The sports are evolving each and every day and more and more youth are getting involved. Lifting can be so incredibly positive and rewarding and I feel that women may be more interested in the sport than they originally may think. It is challenging both mentally and physically and it can be a great tool for channeling emotions, depression, and competition. I hope that more females who are interested in this sport begin to branch out, research, and explore these activities. I have felt more empowered because of lifting and I feel that it can do the same for others. 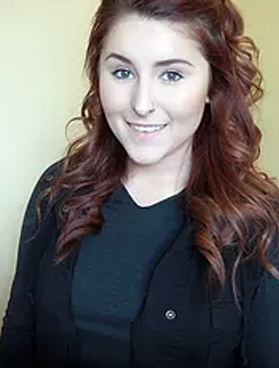 Victoria has a degree in Exercise Science from Grand Valley State University, and a strong passion for not only exercise but nutrition and wellness as well. She focuses on powerlifting while training in the gym and quickly realized that a strong diet results in a healthier and more effective gym experience. She wants to share this knowledge with others through an online community just as passionate about fitness.